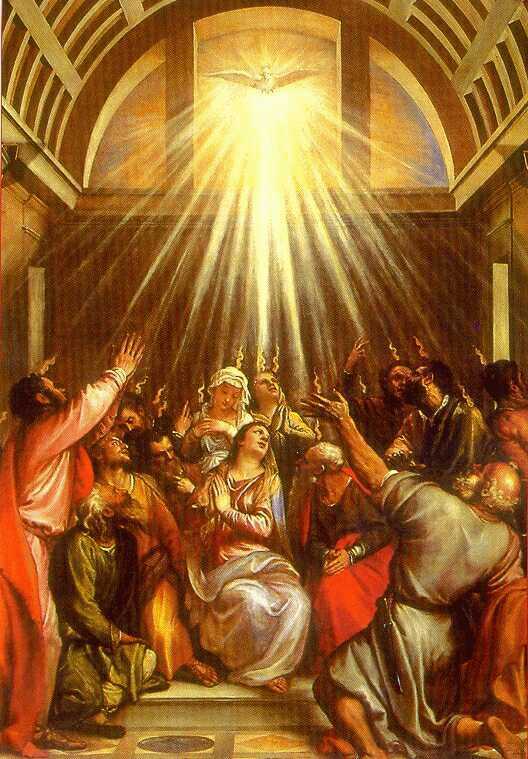 The Feast of Pentecost is taken from the Greek word πεντηκόστη which means “the 50th,” referring to the fiftieth day after Passover and Easter. In the Jewish calendar, this would coincide with the harvest festival Shavuot the “Feast of Weeks.” In the Christian calendar, Passover played a part in a number of visits Jesus made to Jerusalem, but most famously, it marked the coming of the Holy Spirit, as “tongues like as of fire” upon the Disciples of Jesus along with the sound of rushing wind, as told in the New Testament Book of Acts Chapter 2. This marked the beginning of the work of the Church following the Resurrection of Jesus. Indeed, as the New Testament tells us that Jesus remained with his Disciples for 40 days following his Resurrection before his Ascension into heaven (celebrated last Sunday), this would mark 10 days following the Ascension of Jesus. This event was associated with the Disciples speaking in other languages. Many visitors to Jerusalem, who were likely there for the Feast of Passover, were curious about the meaning of the flames, wind, and foreign tongues — some familiar to them. The Apostle Peter gave his first sermon and the Church in Jerusalem grew in size from 120 believers to 3,000. While Ascension Sunday is not much celebrated in the US — rather in parts of Europe, especially Germany — neither is Pentecost Sunday much celebrated in the US, other than in more liturgical churches. It is celebrated in various regions of Europe. In parts of Eastern Europe it is known as Green Sunday or Green Holiday where it is attended by wearing green and decorations with green branches — perhaps a reference back to the Jewish festival of Shavout and its decoration of the synagogue with green. Pentecost is recognized as a bank holiday in the United Kingdom, where it’s known as Whitsun or Whitsun Day, meaning either White Sunday, or the Sunday when whit or wisdom was brought upon the Disciples. I very much disagree with your comment that Pentecost is not much celebrated in the United States. It may not be as much as in the traditions of the European churches, but it is not something to be dismissed. Being active in a United Methodist Church in the US, my congregation very much celebrates Ascension as well as Pentecost.